Jackpot Capital Casino is staying true to its promise to add more mobile slots and casino games to its mobile casino. They've just added a monstrous new game called T-Rex and this weekend you can get 20 free spins to try it out. I think you're going to be amazed by how great the mobile games from Realtime Gaming look on your phone or tablet! The coupon code for 20 free spins on T-Rex is TREXMOBILE for this offer which is available until Monday, January 27 only. No deposit is required. 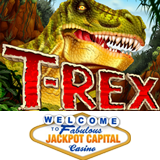 T-Rex is a 5-reel 25 payline dinosaur-themed game with a bonus round that awards free spins. It takes players back in time to when tropical foliage covered the earth, volcanoes were widespread, dinosaurs roamed freely and T-Rex was the most feared dinosaur in the neighborhood. The T-Rex Pick feature is triggered when three or more Scatter symbols appear. Players then select then select Eggs to reveal up to 10 free games per Egg. Jackpot Capital’s mobile casino games are all optimized and enhanced for iPhones, iPads and Samsung Galaxy S3/S4. The growing selection of mobile casino games includes Aztec’s Millions which has a progressive jackpot that’s currently about $1.5 million. Jackpot Capital Casino players always earn points just by playing and its current “Casino Race” promotion continues to award $30,000 in casino bonuses every week. Points are doubled for mobile game play. Are you reading this on an iPhone, iPad or Samsung Galaxy S3 or S4? If so, tap this link to go to the mobile casino lobby: http://www.m.jackpotcapital.eu.